To support survivors of the recent earthquake and tsunami, Groupon Japan is tapping into it's user base to raise funds for the Japanese Red Cross. 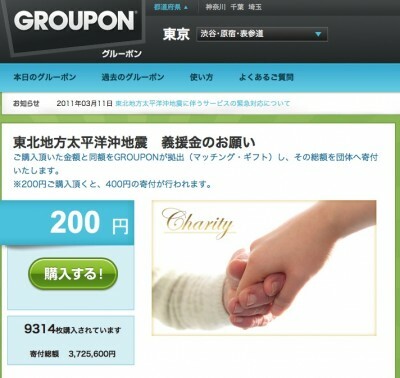 For every purchase of 200 yen via their website, they will donate 400 yen. According to Asiajin, they've already raised 3.8 million yen (US$46,000 or so). Asiajin also has a post with extracts of coverage from the Japanese web.